I've compiled a second list because there were a few more that I felt should be termed as classics. When the Balenciaga Motorcycle bags were first introduced in 2001, they were all the rage. Ten years on, they're still as popular as ever. I will admit that I wasn't a fan in the beginning. I was in Hong Kong at the time, every woman on the street were either carrying a Louis Vuitton or Balenciaga bag. I probably suffered an overdose from the exposure of the two brands. I know that both the Celine Mini Luggage tote and Box bag are still relatively new on the market but boy oh boy, are they understated and elegant or what! I don't own either but I'd love to. I can still see myself carry them a decade from now. I'm a huge fan of jackets. With the right cut and superb tailoring, they can make you look like a million dollars (Chanel jacket) or give an illusion that you've got a tiny waist (Rick Owens leather jacket). The Chanel jackets and cardigans have been reworked many times over since Coco Chanel first designed them but they never date. Ever. The French and Italians have an amazing flair for wearing scarves. I'm just in awe watching how they twist and fold and then pair the scarf with the simplest outfit. Et voila, they walk out looking so chic. You must be wondering why I chose this particular design. Ex-libris (the horse and carriage) was designed by Hugo Grygkar who worked for Hermes from 1946 to 1959. It was first issued in 1946 and has been reprinted countless times since then. One of my favorite Hermes shawls has to be the Ex-Libris in grey and white. It is so classically beautiful whichever way you wear it. The Longchamp Le Pliage is quintessentially French. If you walk around Paris, the bag that most women carry isn't Louis Vuitton but a Longchamp Le Pliage tote. Phillippe Cassegrain, the previous CEO of Longchamp and founder's son designed a bag that's not only aesthetically pleasing to the eye and lightweight but also remarkably durable. What's more you could fold it up into a tiny little pouch. The best thing of all, the Le Pliage range is very affordable. I've been wearing Repetto flats for years now. They're just as good as a pair of Chanel flats but doesn't hurt your pocket as much. I fell in love with Chanel costume jewelry after seeing vintage ones at the St Ouen market in Paris. They're far from cheap and vintage pieces can cost thousands of dollars. I can't omit the Hermes bracelets. You can wear a plain ol' t-shirt and jeans but the minute you slap on these badass bracelets, you just feel different. I agree with so much of this list, especially of the classic value of those x-wide Hermès enamels. They are marvelous for raising the tenor of an outfit. Several of these pieces are on my wishlist for the future (this or next year): the tweed jacket (Isabel Marant, rather than Chanel), the box bag, a Longchamp bag. Aesthetic Alterations, believe it or not, my next post is on Isabel Marant tweed jacket from the Fall collection. I'm dying to get it so fingers crossed it'll be back in stock. I love the H enamels but sadly the PM size is way too big. Thank goodness for Clic Clac, CdC or Kelly Dog bracelets. Sog19b, I think the recession helps cull impulse buys to a minimum. 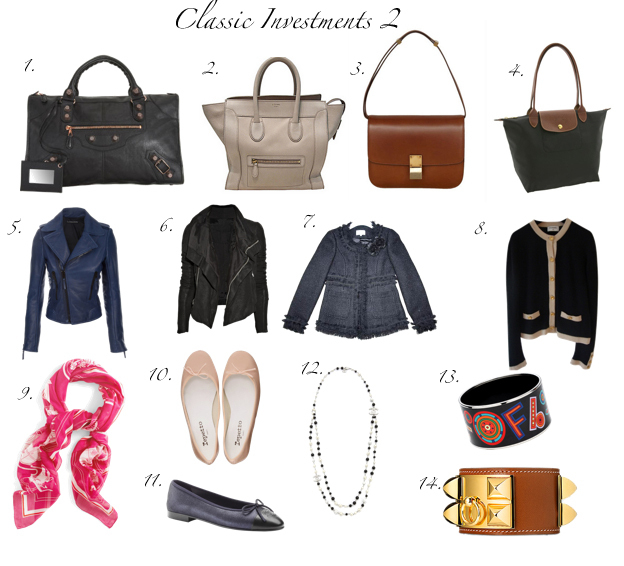 These days, consumers tend to focus their purchases on classic pieces. You are killing me...I really really want a Chanel cardigan and have been looking for the perfect one (at the right price) FOREVER - where do you get yours? Kat, I wish the Chanel cardigan in the photo was mine. I was lucky to find a few Chanel gems at thrift shops at basement prices but no longer (!!). Great list! And a very nice blog! Thank you for the lovely compliment, Olga. Much appreciated! Thanks, Sam. The 2 lists remind me to stay on track and not give in to too many impulse expenses.